Over the course of this now thirteen book series set in Regency England, the Captain Lacy mysteries have become a personal favorite. When we first met Gabriel Lacey, he is a half-pay officer living in reduced circumstances in a dodgy London neighborhood. Gravely wounded in the Peninsular Wars, he suffers both physically and mentally. Since then he has reconnected with his daughter who was taken from him by his then-wife, who ran away with a French officer, acquired some significant friends, both in Society and in the criminal underworld. He has also married a titled widow with bottomless pockets. The marriage is a love match and he and Donata, Lady Breckenridge, have a daughter of their own. Gabriel returns home one evening to a household in an uproar. Donata's relatives from her earlier marriage have come and want to take her 7-year old son, Peter. Donata is very well aware that their real interests lie in Peter's future fortune and title. In the midst of this confrontation, Brewster, Gabriel's "bodyguard" supplied by the enigmatic underworld figure, Mr. Denis, arrives needing Gabriel's help. 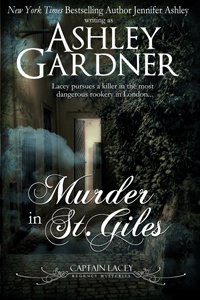 A murder has taken place in the dangerous slum of St. Giles. Brewster's wife fears that Brewster will be blamed. Gabriel is torn, but since he literally owes his life to Brewster, he leaves Donata to deal with the grasping relatives. Luckily, Donata is more than capable of doing so, one way or another. The investigation takes Gabriel and Brewster into the darkest corners of St. Giles and even to the infamous "hulks" on the Thames, where prisoners are kept before being transported. The usual characters make an appearance: Grenville, Marianne, the Bow Street Runners, and Magistrates. Of course, Mr. Denis, who actually seems to be thawing a bit, has a part to play in the adventure. I always appreciate the research that goes into this portrayal of this most exciting part of British history. I highly recommend The Captain Lacy Mysteries. It occurs to me that the series would make a perfect beach/binge read for the summer.